July is one of my favorite times at the farm. The berry harvest is just about finished and the peony harvest has ended. Although those are 2 of my favorite crops, I feel like the energy of them is manic. By July, we have settled into a nice routine. The interns know their way around the farm. All the baby animals are their most adorable in July. This year, the kittens that Flora is fostering from the Brunswick Animal Shelter are stealing the show. All I want to do is take photos of flowers and kittens. It's like some sick inspirational poster taped to the drop ceiling at the gynecologist or dentist office... "Hang in There..." the July farm motto. I'm contemplating creating a whole line of them to hang around the farm this summer. The kittens, for those who might be interested, are all available for adoption, as is their lovely momma. In July, the days never end, they just blur one into the other. We harvest, plant, weed, kill bugs, water, make deliveries, eat, fall in to bed and then do it all over again the next day. At night or over eggs at breakfast, John and I plot our winter excursions. We dream about what's next. We are the best workers when we are incentive based. There is some talk about participating in the USAID Farmer to Farmer program. This morning, we plotted Ethiopia on the map. In winter, our dreams are all about new varieties, new techniques, and better management of our own operation. Summer days are spent attempting to execute these well laid plans. Dreams in summer... its all about "Hang in there..." and kittens and flowers. No time for dreams, this is reality time, Croqs on the ground time. In the meantime, we are loving the sugar snap peas and all the fresh greens. The flowers are at the top of their game. And, if you are lucky enough to get to trellis tomatoes, you've sampled the first of the ripe sun gold cherry tomatoes. They are nothing short of spectacular. Strawberry season lasts a short crazy three weeks of good picking. 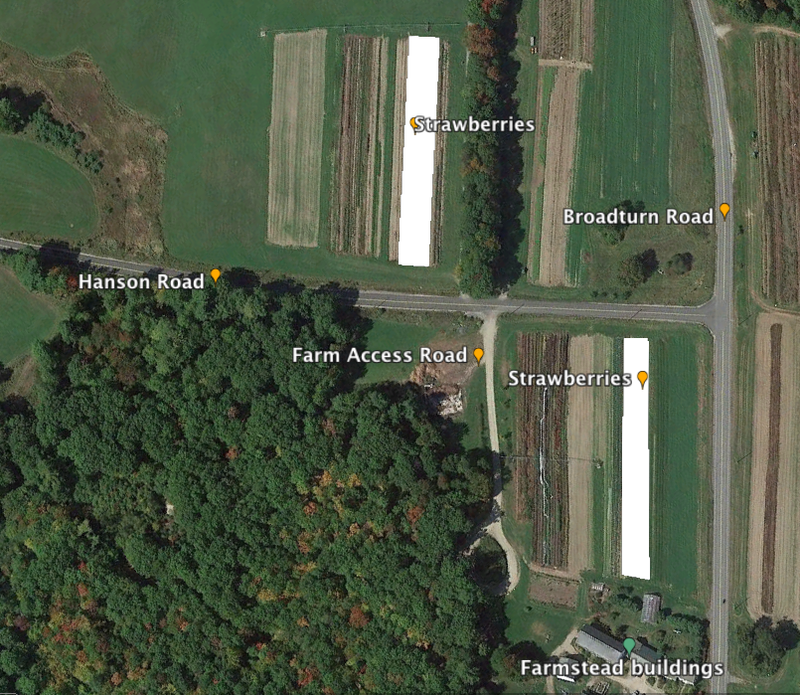 (no more than 15 minutes per quart is what we tell our pickers) There are still berries in the field but we are done with picking... as a loyal CSA member, with a summer evening on your hands and pies to make, you are welcome to find the strawberry fields and pick as you like. One of our strawberry fields is across Hanson Road and the other one is behind the greenhouse. See the map below. You might want to print it out to find it. We are NOT a pick-your-own berry farm. You won't find straw between rows and loads of large plump berries. These are strictly extras. Help yourself. We picked up Flora at summer camp over the weekend and drove through the hills and dales of Maine, passing numerous 4th of July festivities. I have never been on a road trip during Independence Day, and it was charming and surprising to see how each little town or village had its own, unique parade without a shred of sponsorship besides the town itself. Tractors, firetrucks, old fashioned automobiles, and home-made floats on equipment trailers... all billowing with American flags. Eventually we found our way to Georgetown, my family's community. There we participated in the Five Islands' blessing of the fishing fleet, and the parade of lobster boats. I guess I always thought Georgetown was special in its down-home celebration, but it's just one of thousands of similar expressions of communal personality. Stella rarely leaves the farm, and has never been away over night. But we took her on this little trip, for Flora's pleasure, for the adventure of it, and for Stella's sake-- she hates being alone with the fireworks of the 4th. She was well behaved, but a little overwhelmed. The season is starting off great at Broadturn Farm. Our early tulips, narcissus, and perennial flowers offered an early boost into the markets which we have been building in the world of local cut flowers. We also have twice the amount of strawberries planted so we've been filling orders for Rosemont markets in Portland, the Portland Food Co-op and a few other places. 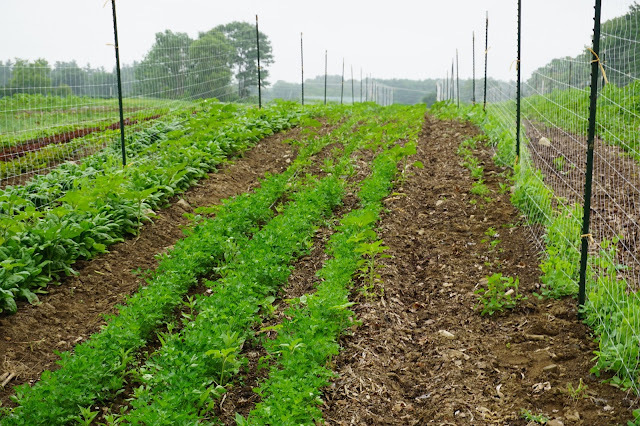 We have been focusing on these wholesale outlets since last year as our CSA vegetable operation has plateaued. That said, CSA remains our primary focus on the farm. 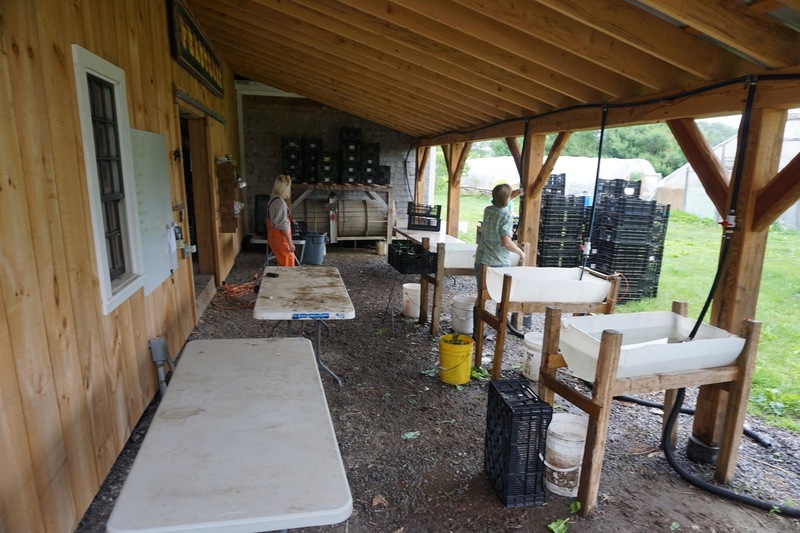 14 years ago when Stacy and I started farming in Cumberland, it was clear to me that Community Supported Agriculture was the way forward; the business model with no down-side. Good for the farmer: An assured market, up-front capital, and permission to grow a wide variety without worrying about "loss-leaders." Good for the consumer: A discounted product of the freshest kind, a connection with a farm, and an encouragement to eat that wide variety of healthy produce. 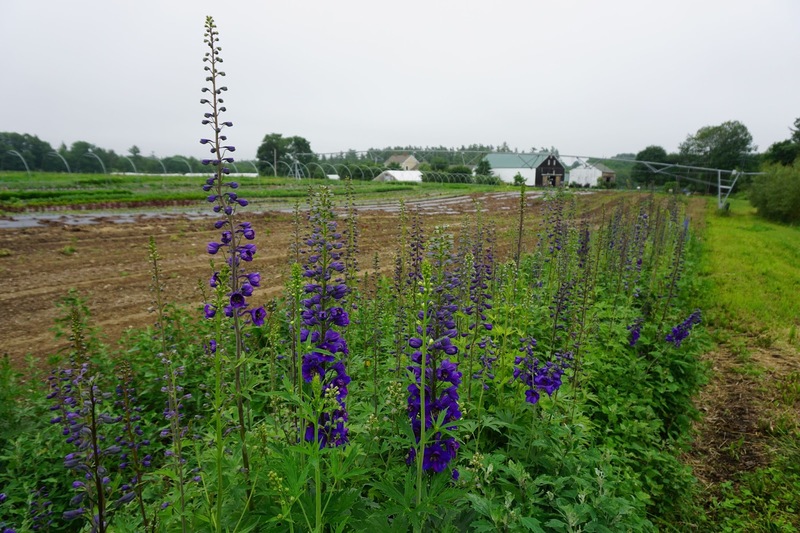 It also appeared fundamentally good for the environment since stabile, non-exploitative markets nearly always lead to positive ecological choices, and customers were supporting our choices to grow organic produce. We still stand by the central tenants of the CSA model, but all things evolve and we have dealt with problems with many facets of this kind of farming. 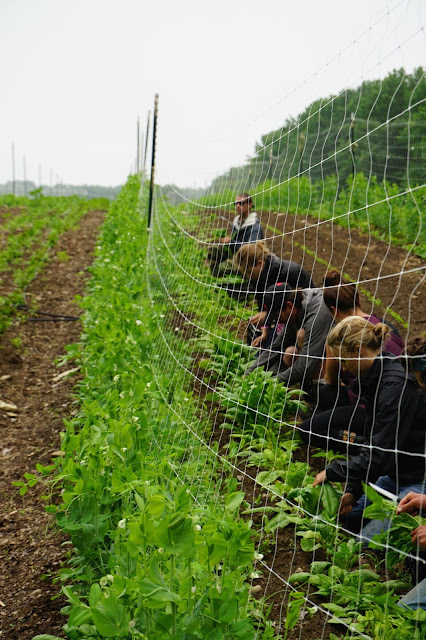 As we have matured we have gotten a sense for other opportunities beyond CSA, just as some of our customers themselves move beyond the model and one way or other become more tied into the local food movement in ways apart from being a CSA member. But there is still no better way to get an infusion of the freshest and diverse produce into your kitchen than CSA. And this week is flush with Greens! This is the week that we are turning over fields to begin a summer-fallow period. This allows us to diminish the weeds in our fields while still maintaining a good amount of organic matter in the soil. We have been growing good cover crops of rye and vetch all winter, and now we mow it, chisel plow it, and work the cover into the soil. After a few weeks it will look like the picture below, ready to be planted to another cover cropping. 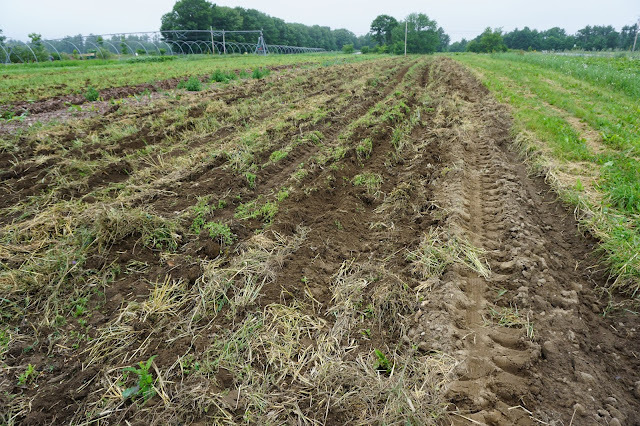 Tilling is damaging, and cover cropping is restorative, and after 8 years of doing this at Broadturn Farm, we have seen great improvements in the quality of the soil. 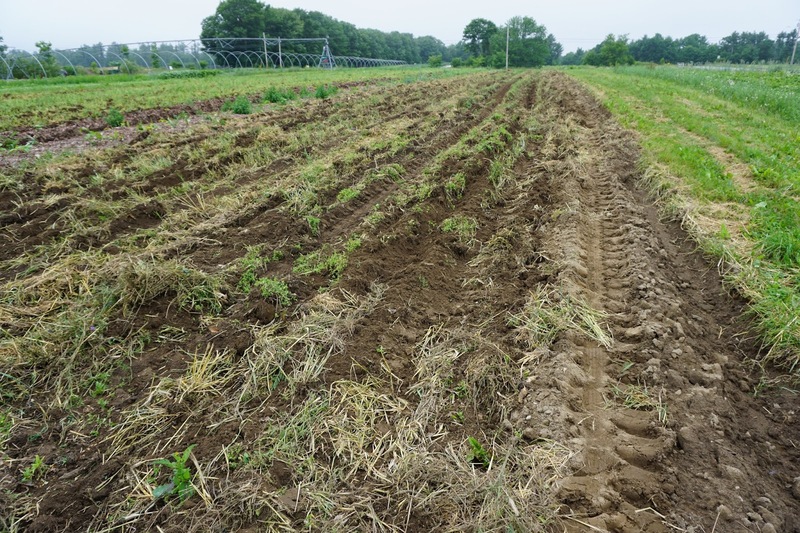 This picture below is of a freshly plowed field from sod. Its very exciting to turn over new ground. It reminds me of our first years farming. Inexperienced as we were, there was so much potential after making that first step forward into farming. An unwritten, blank slate; this one up along the road in our Fogg field, will be filled in with an expansion of rhubarb in the coming years. Thanks to John Snell for selling us that sweet moldboard plow! As we approach the summer solstice, with a berry stained hands and our arms loaded with peonies, it all feels right. Our crew this year is amazing. There are old faces and new faces and everyone's hands seem to be able to move while they talk (important criteria for farm work). I love to hear their dreams, watch them learn new skills and overhear last year's intern who is now a returning employee skill share with a new intern. Knowing they are learning, gaining skills, eating well and being present in the work and in this moment of their lives makes personnel management ever so pleasant. And, we say it every year, but the truth of the matter is they make this place what it is. Without them, John and I would be, well.... pretty lonely and working really hard to keep up. There are some introductions to be made. For those of you who are planning to visit, there are 2 adorable baby goats. They are still without names. They are 3 and 5 weeks old. They are currently living in the animal barn. This season's pigs have arrived as well. They are in the tree line in the field across Hanson Rd from the farmstead. They love company so make sure you go up and say hi. And, a little harder to visit but undeniable the cutest, there is a batch of kittens in the farmhouse. Flora is fostering a momma cat and her 3 babies in the bottom drawer of her dresser for the Brunswick Animal Shelter. She has a lifelong (all 8 years of it) dream to run a cat shelter cafe where you could come in and have tea and pet cats. At 8 weeks of age, the kitties will be ready to be adopted. They are heavily handled by our resident cat whiperer so I do expect some well socialized felines to enter society after they leave here. Kittens anyone? Or a lovely momma cat who is a baby momma herself? If you're interested, you'll need to adopt them through the Brunswick Animal Shelter. This week is our first CSA distribution of the season. As with other years, things are just getting started with the first harvest. The winter held on for longer than usual and we thought we would be late on most early crops. Then we had a week of unseasonably hot temperatures and we lost a few crops to the heat: most of our first broccoli and the pac choi. The chives, rhubarb and sorrel, all perennial crops, have committed themselves to flowers, but we will still harvest what we can. 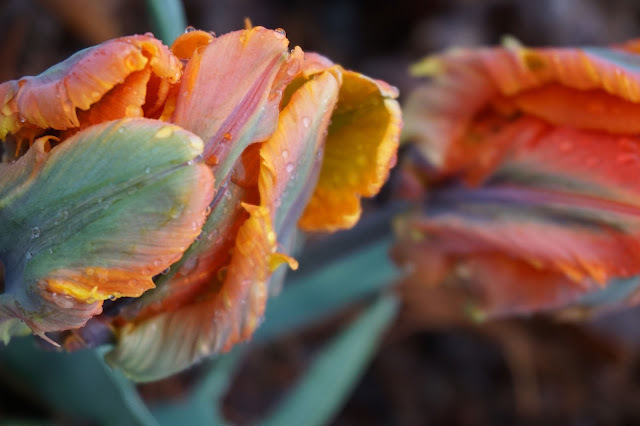 On the flower side of the farm, we had a great tulip and narcissus harvest and are eagerly awaiting the peonies by the end of the week. Strawberries are not far away after that. And on and on and on. Planting and harvesting so many crops and some many successions feels like a whirlwind which sneaks up behind you and before we know it, the abundance in the field is overflowing. We have a great crew this spring with plenty of familiar faces from years past. We continue to try some new tactics while staying true to the goals of soil building and natural pest management. You might be wondering who writes these words, and those of you who know us well and who have been with us for years mill be able to hear John's voice behind this, our first, CSA newsletter. Where is Stacy? Well, Stacy has gone off a deep end of sorts. You see, Stacy does most of our marketing around here, so unfortunately she gets pretty involved in the social media side of things: posting to Facebook, post pictures of flowers and produce on Instagram, not to mention the constant phone calls and emails that go though her smart phone. Talk about a whirlwind. By mid-Spring she is like a spinning dervish or a samurai doing all one has to do to keep the ship afloat. It was nearly too late before we noticed her crazed dependency on the chatter of social media, and we pulled her phone out of her hands. Responding as quickly as possible, we deleted Instagram and Facebook from her phone, signed her out of her Amazon Prime account, delegated Pinterest to Laura, and allowed the Spotify playlist to play out... Silence. Yesterday morning Flora came downstairs, and Stacy looked at her with fresh eyes. "You smell like summer" she said to her daughter. Flora took a whiff of Stacy and said, "You smell like dirt... and coffee." As it should be. And, so though this newsletter is a little dry and not as wild as one of Stacy's posts, I'll stay at the helm until we can get Stacy back to normal. Broadturn Farm. Ethereal theme. Powered by Blogger.